Expressing alarm over the "rise of communalism" across the country under the BJP regime, the Left Front in West Bengal on Wednesday flayed Prime Minister Narendra Modi for "evading responsibility over the Dadri lynching".Referring to the murders of rationalist Narendra Dabholkar, leftist Govind Pansare and scholar M.M. Kalburgi and the lynching of a Muslim man in Uttar Pradesh's Dadri, Left Front chairman and CPI-M leader Biman Bose said the Modi government had communalised Indian politics to such an extent that the country was teetering on the brink of a disaster. "In a very short span of time, the BJP government has polarised the entire country, dividing people on communal lines. The situation is so alarming that many more Dadri-like incidents are waiting to happen," Bose told the media here. The Communist Party of India-Marxist leader also attacked Modi for his claim in an interview to a Bengali daily that the Centre could not be held responsible for the Dadri lynching. "All these days, Modi tried to evade responsibility by maintaining silence and now he is doing the same by saying that the central government is not responsible. His comments are highly deplorable and an attempt to trivialise an incident that led to a nationwide outrage," said Bose.The veteran Marxist leader also extended support to authors who returned or announced to return their Sahitya Akademi awards as a mark of protest against rising intolerance in the country under the present government.Bose also accused Modi of endeavouring to get India entrapped under US imperialism, adding that the Left parties would take out a rally in the city on Friday against the rise of communalism and imperialism. "Under Modi, attempts are being made to get India entrapped in US imperialism. Modi has been endeavouring to ensure that he works subservient to the US president. This rally is not only against the rising communalism but also against this attempt to allow imperialism to flourish," said Bose.The rally will also oppose the Malabar joint naval exercises with the US scheduled from October 14 to 21. "The joint naval exercise is yet another example of the rising influence of the United States on India. The fact that it is being conducted in a hush-hush manner also raises doubts," the veteran Marxist leader said. "It is the duty of the Left parties to stand up against the Modi government's attempts to communalise the country and allow imperialism to flourish. 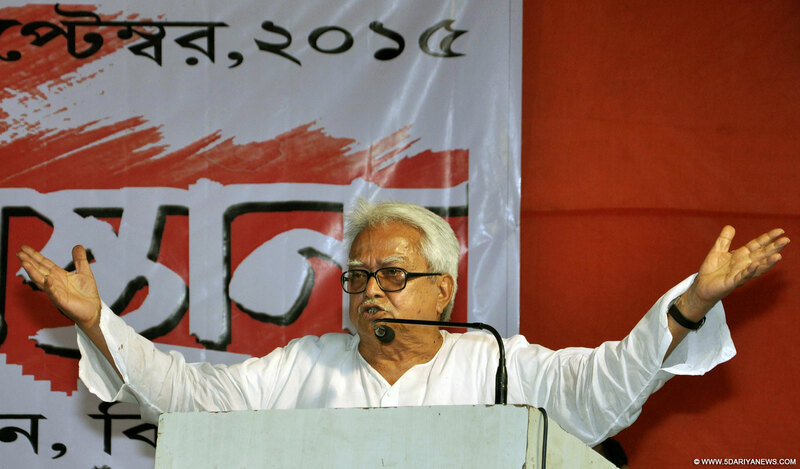 We call upon the people and organisations - irrespective of their political affiliations - to join the rally," Bose said.